Thanks in large part to Daniel Carcillo’s awful decision making, the Blackhawks lost their first game of the new calendar year. Leading 1-0 early in the second period, Carcillo slammed Tom Gilbert into the boards. Carcillo was hit with a five minute major penalty for boarding as well as a game misconduct, though he would have left the game with an apparent leg injury anyway (see photo). The power play that resulted from Carcillo’s stupidity saw the Oilers score twice to take the lead, and the momentum was on Edmonton’s side the rest of the night. On the positive side of things, rookie Jimmy Hayes scored his first NHL goal to get the Blackhawks back to within one late in the third period. Hayes was limited to six shifts in the first two periods, but came on strong at the end of the game. Coach Joel Quenneville rewarded the rookie with 59 seconds of power play time in the game’s final moments. Edmonton leaves Chicago banged up. Ryan Nugent-Hopkins left the game during the first period with a shoulder injury and did not return. Gilbert did not return after the Carcillo hit, and Shawn Horcoff appeared to get hurt in the third period as well. Despite their injuries, the Oilers leave Chicago with a victory as well. The officiating in the game was mediocre with a number of missed calls, including a high stick into the face of Niklas Hjalmarsson by Taylor Hall the led to Hall scoring the Oilers’ first goal. But the painful reality for the Blackhawks on this night was that they simply weren’t good enough to win a game. Chicago battled back to tie the game at two, but then allowed goals to Andy Sutton and Ben Eager to dig a hole too deep to escape. It was Sutton’s second goal of the season, and the third for Eager. The Hawks received six minutes of power play time in the game’s final 10 minutes but couldn’t capitalize. In total, the Blackhawks failed to convert on five power play opportunities on the night. Jonathan Toews and Andrew Brunette scored the other two goals for Chicago. Nick Leddy blocked four shots in 27:59 in the game, while Brent Seabrook blocked a team-high six and was credited with three hits in “only” 26:23 on the ice. Duncan Keith skated a team-high 29:39, blocking one shot in the game. The meathead part of me says I would like to see Jimmy Hayes work with Toews and Hossa on the top line…Hayes can be the near-physical power forward who will cycle it to Toews and Hoss. I know he’s only 20 and it’s his second game, but the Hawks need size-speed-skill on that top line. even thought the 5min major gave them the tie, it didn’t give them the lead. The ref’s did by not calling that high stik to hammer with 2min left on the major. Then the game is 1-1,2-2,3-3, win or tie not a loss. That was the difference. We need to get good shots and then will get goals on the power play. We are not even getting good shots. Thats bad. Power Play needs to get good shots, its sucking. PK is decent. If were not going to trade to get the last 2 players to our lineup until game 50-60, were going to need Hayes and someoneelse play regular min until then. We should play Hayes w top line and have Pirri/Morin/Smith play more, not Scott. Scott/Lepisto can take turns until Monty is back. This game was crap. Bad passing, defensive lapses, way too many turnovers, dumb penalties (I hate to see anybody injured, but let’s hope Carcillo is done for the year) and a worthless PP. Yes they need good shots to get goals, but right now I would be happy to see them get set up on a consistent basis.. You can’t get good shots if you can’t set up. Penalties go both ways throughout the season and if they missed the high stick on Hammer that’s just part of the game. You accept it and move on, but when you play 60% of the final 10 minutes of the game with the advantage and you are unable to score you do not deserve to win. I hope I’m wrong but I see another loss coming on Thursday if they don’t fix the PP quickly. 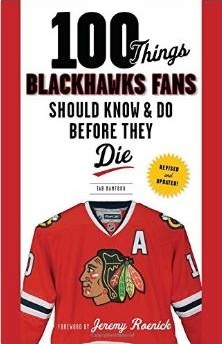 I agree with everything Tuke said except hoping Carcillo is done for the year. That was one blockheaded move he made & as much as I like him, he deserves a suspension for it. But, what about all of the other games we’ve played with bad PP,PK, DMen awol, guys not showing up mentally to play? Just saying post-game “Well, we need to do better” doesn’t help. Unless we fix these basic weak spots, we won’t make it to post season. The dumbass penalty play tonight would not have made as much difference if the other areas were solid. Excellent points by Debbie. How many times do we need to hear post-game, “We need to be better,” “We just didn’t come out with a lot of intensity.” Are you kidding me? You don’t win championships by taking many nights off during the season and not being able to score on the Power Play. Corey Crawford quoted as praising the skill of the Oilers for their success on the Power Play. Many consider the Hawks top forwards as being as skilled as any in the league. Time to show it. Wake up Hawks! You may be leadin the West, but won’t for long with this kind of play. I predicted 5th in the conference when the season started. Check the standings, it’s not far off. And, with more games like last night, it’ll be a reality sooner rather than later! Coach Q and Bowman need to sit the Hawks down and make them watch the 1st 3 minutes of the Oilers PK on that 4 min. PP the Hawks had, over and over!!! I think we had ZERO shots- nevermind the shots- I don’t even think we looked at the net, we were too busy chasing the puck w/ two oilers attacking each Hawk! I thought I saw the ref signal the Oilers for too many men on the Ice… but no there were only 4! WOW! that was bad! With all the 5 million dollar guys on that powerplay, and the Hawks have me praying for Kruger to get back to possibly make it better???? Here is another name to consider- Shaw- he is hot and is not afraid to go to the net- has been lighting it up in Rockford. Put Hayes on Hossa- Sharp line or Toews-Kane line… or Shaw. Pirri has alot of upside but still way to weak physically. I’m an oilers fan who loves the hawks for their great work in previous years against the canucks and flames. Don’t know why but the hawks seem to put in half assed efforts against the oil. Maybe its hard to engage mentally in a game against an inferior team. i hope to watch you guys go on another playoff run soon while i wait for edmonton to develop into a legitimate playoff contender.